The bernette 340 deco is bound to make embroidery one of your favorite hobbies. Embroidering can be that easy! Drag ‘N Drop: Move and reposition designs with the greatest of ease by clicking on them and dragging them across the touchscreen. Upper Thread Indicator and Lower Thread Check: The upper thread indicator automatically stops the embroidery process if the upper thread breaks or when the spool is empty. The lower thread spool is also checked before each embroidery process. The result: guaranteed reliable embroidering. 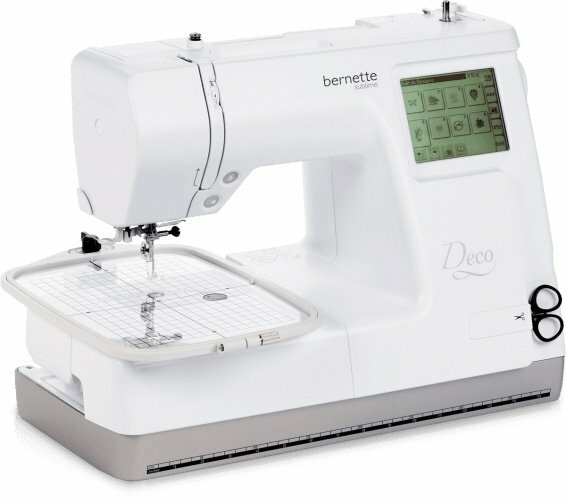 Free Arm: The bernette 340 boasts a free arm that lets you embroider tubular textiles such as e.g. trouser legs or sleeves. We recommend using the optional embroidery hoop along with the free arm. Special Compartment for Scissors: A handily located holder for your embroidery scissors is built into the machine, roomy enough to house both the new scissors that come with the machine and your old pair. Flexibility with Embroidery Cards: Avail yourself of the huge choice of compatible BERNINA embroidery designs on embroidery cards. You can also use commercially available personal design cards to transfer your own designs from your PC. Your personally created combinations are either saved directly to the bernette 340 Deco’s memory or to the personal design cards. Huge Embroidery Surface: Using the two hoops that come as standard, you can embroider designs measuring up to 200 x 140 mm in a single run. Additional optional hoops are available for special applications. Flexibility with USB Sticks: Avail yourself of the huge choice of compatible BERNINA embroidery designs on USB sticks. You can also use commercially available USB sticks to transfer your own designs from your PC. Your personally created combinations are either saved directly to the bernette 340 Deco’s memory or to USB sticks. 100 Great Embroidery Designs: Avail yourself of the 100 exclusive, permanently integrated embroidery designs, and enjoy the fine, precise embroidering quality of the bernette 340 Deco. Color Display and Built-In Color Charts: The color display gives you color recommendations for each embroidery design. The built-in color charts from four leading thread manufacturers convert each color in the design to those of your preferred thread manufacturer. Exclusively available is a mode displaying color information as the designer has imagined it – ideal for using up thread remnants. Embroidery Time Display: Before you start to embroider, the total stitching time for each design is displayed – and the remaining time is continuously displayed during the embroidery process. Mirror, Rotate and Scale: The bernette 340 Deco makes it child’s play to combine and edit designs on the large, clear touchscreen. Using the microrotation facility, you can now even rotate the design in 1° steps.